This Remove Before Flight Banner comes with a grommet and wire ring that can be attached to everything from gear pins to gust locks and pitot covers. A bright red heavy nylon Remove Before Flight Banner that can be fastened to anything that needs removing before flight. Comes with a grommet and wire ring that can be attached to everything from gear pins to gust locks and pitot covers. 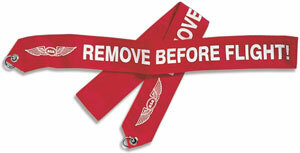 This Remove Before Flight Banner is made of heavy duty vinyl that is tear resistant. Advertises Aircraft For Sale and is made of heavy duty vinyl material. Made in the U.S.A. The Ultra Caddie is the best cockpit organizer ever. Also a great organizer for your car, boat, truck and more.